27th International Fanday - save the date !!! - Thomas Anders Online - Die offizielle Fanpage! 27th International Fanday - save the date !!! in a couple of days the summer holiday starts and I´m more than happy to announce the date for the 27th International Fanday. 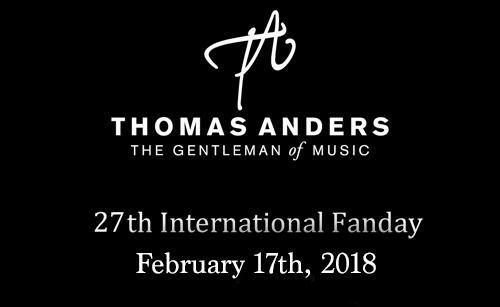 The upcoming International Fanday will be on February 17th, 2018. The event will take place in the same venue like in the past years in the Stadthalle Ransbach-Baumbach, Germany. The ticketsale for the International Fanday in the afternoon and the concert in the evening will start in the beginning of October. More detailed informations will follow in September. I hope to meet you in Ransbach-Baumbach, Germany. So please save the date! Enjoy the summer 2017 and your holidays. Good morning my beloved Thomas, you're th light that makes me wake up in the morning, I love you so much and Wish some day my dream will come true and we'd be happy to meet each other. I❤u with all my heart, all my feelings. Hello, I need to tell Thomas about my lost of money by fake accounts in August-Sep. 2017, are u going to do something against those fake accounts? U must feel pleased. Otherway I've lost my son since 2 weeks now because I've an hándicap and deputation think I can't grow him well, I'm sad. U must feel blessed, sorry.